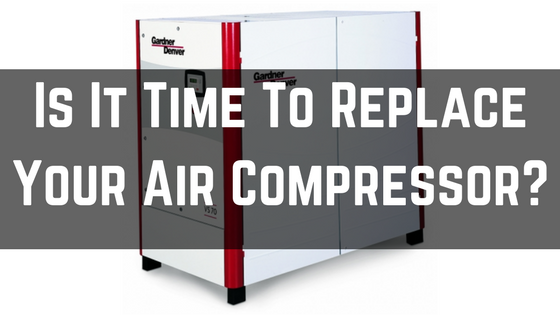 Is It Time To Replace Your Air Compressor? When it comes to industrial manufacturing, the importance of having an industrial air compressor that’s working can often be taken for granted. The only time any concern is directed in that area is when something breaks down, which can lead to costly delays that potentially end up affecting customer relations and a company’s bottom line. Fitz Equipment has seen those circumstances develop during our years in the business, which is why we’ve provided the following information on how to know if it’s time to replace your industrial air compressor. Any air compressor should be humming along, doing its job without too much of a racket. The onset of a strange noise coming from that area is a pretty clear sign that something is wrong. That noise usually is akin to a knocking sound that requires attention immediately, whether it’s repair or outright replacement of the equipment. The problem could be related to a belt, flywheel or crankcase either coming loose or just breaking down. It’s obviously a situation that has to be addressed, with the possibility of this piece of replacement needing to be promptly replaced. Maintaining an air compressor within an industrial setting is important, yet if the need for such maintenance occurs more frequently or repair costs are increasing, it might be time for a change. Otherwise, you’re simply pouring money into equipment that’s living on borrowed time. That maintenance or repair is not only costing money for such work, it’s also limiting the amount of the time the air compressor is in operation. That means that your company is getting hit with a one-two economic punch that it doesn’t need to take. As painful as repair bills can be, the month-to-month expenses that come with the energy needed for old equipment can deliver a similarly powerful blow to a company. These are fixed costs that will most likely rise in the years ahead, with a company’s outdated air compressor often serving as the guilty party in the added expenses that come about. With an energy-efficient air compressor in place, those energy costs will be reduced. That’s because the number of kilowatt hours required to run such equipment declines, which is why replacement should be seen as an investment that will pay off in the future. Fitz Equipment has been around since 1960 and knows how valuable an air compressor can be to the industrial manufacturing market. The industrial air compressors that we provide are all top-notch in terms of quality, and our customer service will make sure that your air compressor service, replacement or purchase are smooth and easy. So when it’s time to consider a new air compressor, make sure to contact us at Fitz Equipment. Does my Industrial Air Compressor Need Service or Need Replacement?